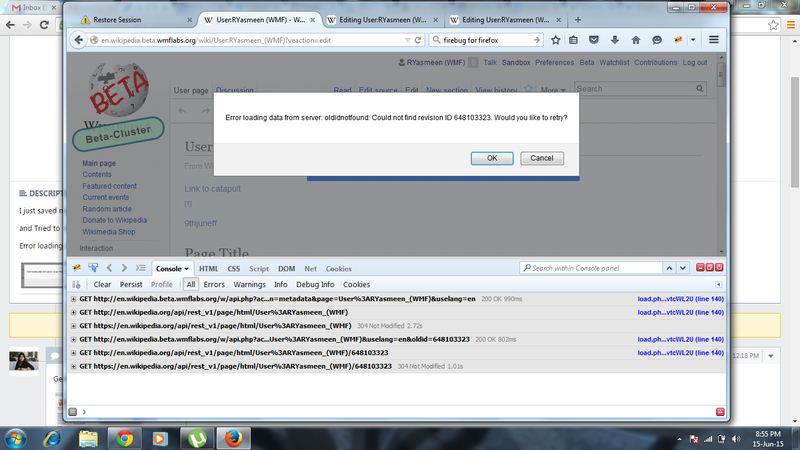 Error loading data from server: ve-api: Revision IDs (doc=658877976,api=658878557) returned by server do not match. Would you like to retry? 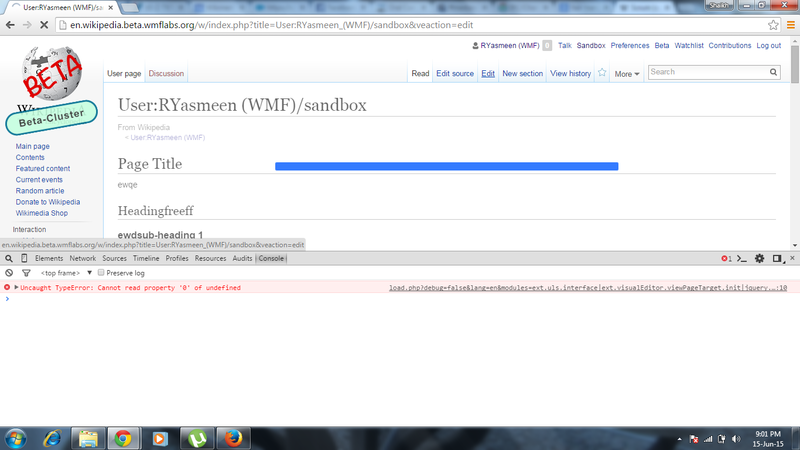 Ryasmeen raised the priority of this task from to Unbreak Now!. Catrope mentioned this in rEVED2dfac313d77e: Don't give up immediately for revid mismatches on second load. Jdforrester-WMF added projects: VisualEditor 2014/15 Q4 blockers, VisualEditor-MediaWiki, WMF-deploy-2015-04-29_(1.26wmf4), WMF-deploy-2015-04-22_(1.26wmf3), WMF-deploy-2015-04-15_(1.26wmf2). Getting this error again in Betalabs. I just tested this and could not reproduce the issue. Krenair, Trying on Firefox? Happens after you open VE for the second time after you save your edit. Have checked it in FF 37, yep. I'm going to declare it a caching issue for now. Ryasmeen reopened this on May 11th without adding a comment. @Ryasmeen: I assume that means this problem still exists? @Catrope: Are you still working on this (as you are set as assignee)? Is the priority realistic here? Asking as this has "Unbreak now" priority. I don't think this happens any more? But I'm not sure. @Ryasmeen reopened this on May 11th without adding a comment. @Ryasmeen: I assume that means this problem still exists? Please clarify as this task has "Unbreak now" priority. Also see the previous comment by Catrope. I dont know if its for the same underlying reason but I am getting this error still in Betalabs while loading VisualEditor. I set it as "Unbreak Now" because it was hampering the further testing unless I am able to load the VE . I've been getting this over the past couple of days too. However, lowering it to high priority since as far as I can tell, it's not impacting production at all. 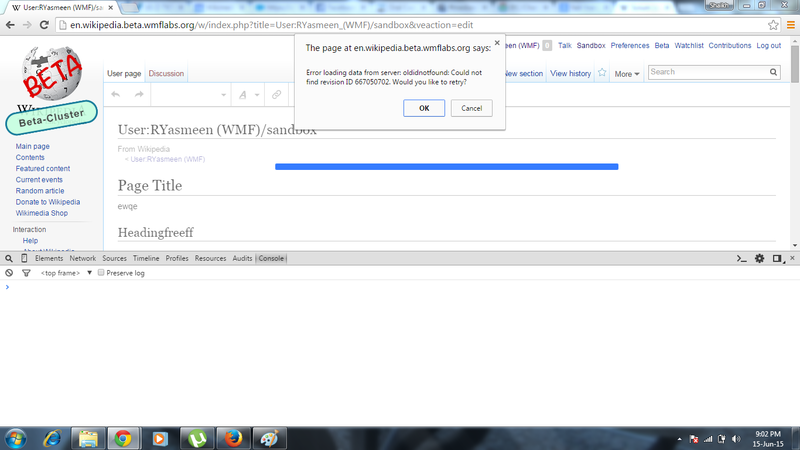 I've tried this many times on beta.wmflabs.org with Chrome 45 and FF 38, cannot reproduce. Let's hope this is fixed. This screenshot doesn't seem to show the issue?